PROUD* charity supporter by villa social e.V. 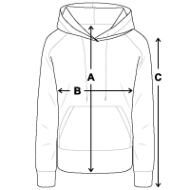 Die Pullover fallen locker eine Nummer kleiner aus und sind eng geschnitten. Cool PROUD* charity supporter women's hoodie with PROUD* charity supporter print and QR code on the back. Have an interesting conversation about this great shirt and invite to scan the code - links either to www.villasocial.de or this shop. 20 EUR of the sales price will go directly to Villa Social e.V. (23.80 EUR provision incl. VAT; Villa Social e.V. recieves the proceeds without VAT).